A few months ago, the wonderfully unique story of Jozef Cavens, a former primary school teacher, came to our attention. Jozef (87) used to live in Pulle, and has been a first grade teacher in Deurne (Belgium) for all his life. He now enjoys his retirement in Wilrijk, Antwerp. During his career, he has taught over 800 children how to read and write with a fountain pen. Passionate about writing, he exchanged his students spelling booklets with other teachers from all over the world. This resulted in a collection of 96 booklets, all the way from Paris to Tanzania. 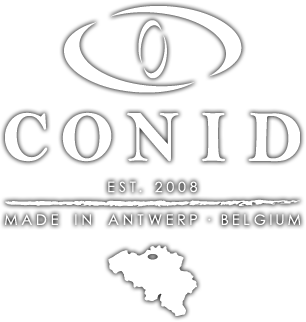 Conid decided to do something with this great story. This resulted in our newest special edition: The Cavens Pen. The Cavens Pen is a special edition of our Slimline model, which is designed to be very straightforward and accessible, focusing on the true essence of writing. This pen has a simple yet elegant matte black finish, with a touch of vibrant red at the rim, to symbolize the red ink Jozef used to write the first letters in the spelling booklets and a subtle wink to Antwerp. The infinity sign at the clip resembles the ongoing and universal passing along of handwriting skills, and supports keeping Jozef’s collection alive. According to Jozef, these booklets motivated his students to write with precision and hopes to collect even more of them. “I hope we get to one hundred one day, and that today’s children won’t stop using fountain pens to try and write as beautifully as they can”, he says. With his special edition, Jozef doesn’t only prove that all of the children around the world write the same way, but also that up until today, handwriting still plays a vital role in worldwide education and children’s development of skills. This opens an interesting debate around today’s growing digital society and the introduction of digiboards, tablets and keyboards in classrooms. With the Cavens pen, Conid hopes to reach people who are also charmed by Jozef’s unique story and passion for handwriting. This pen is therefore an ideal companion for teachers, young writers or simply anyone who loves the beauty and elegance of a fountain pen flowing onto paper.